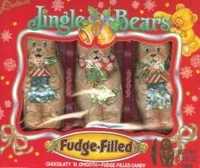 Fudge filled chocolate jingle bears make the perfect stocking stuffer. Who could resist these creamy milk chocolate bears with a yummy fudge filling. Each box comes with 3 foil wrapped bears, each chocolate bear is approx 3.75 oz.